"The Martyr Andrew Stratelates was a military commander in the Roman army during the reign of the emperor Maximian (284-305). They loved him in the Roman army because of his bravery, invincibility and sense of fairness. When a large Persian army invaded the Syrian territories, the governor Antiochus entrusted St Andrew with the command of the Roman army, giving him the title of "Stratelates" ("Commander"). 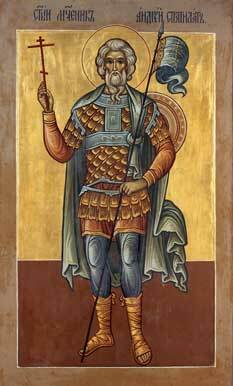 St Andrew selected a small detachment of brave soldiers and proceeded against the adversary. At the time of this prayer the steadfast martyrs were beheaded with swords. During this time, a spring of water issued forth from the ground. Bishops Peter and Nonos, with their clergy, secretly followed the company of St Andrew, and buried their bodies. One of the clergy, suffering for a long time from an evil spirit, drank from the spring of water, and at once he was healed. Reports of this spread among the local people and they began to come to the spring. Through the prayers of St Andrew and the 2593 Martyrs suffering with him, they received gracious help from God." Echoed without a loud human response. In order to hear the new, which it had not in ages, heard. From the earthly life, our separation. Without anger and shouting against the murderous hand. And for their Christ, shed honorable blood. You renounced the glory of earthly rank and inherited the kingdom of heaven; you adorned your incorruptible crown as with beautiful stones. You led an army of martyrs to Christ, and with the angels in the never-fading light you found Christ the never-setting sun. Together with those who suffered with you, holy general Andrew, ever pray to Him that He may save our souls. Standing before the Lord in prayer like a star near the sun, you were filled with ineffable joy beholding your desire: the treasure of the kingdom. You sing without ceasing to the immortal King together with the angels throughout the ages. With them, general Andrew, unceasingly pray for us all.